Entrusting one’s home, or arriving at someone else’s, is never an easy matter! How to select the right house-sitters, if you’re a home-owner. How to select the right house-sit, if you’re a house-sitter. A home-book in order to collect all the important information and instructions. An agreement in order to provide a formal framework for the relationship. 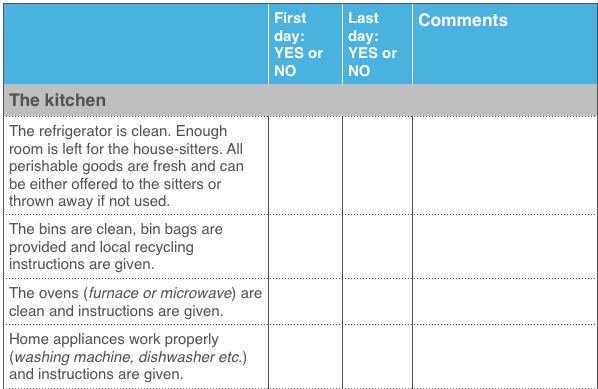 And this basic ‘Home Inventory’ (here below) to check that all key elements are in good condition, before house-sitters arrive and before owners come home. Of course, a house-sitting home inventory cannot be as detailed as a home inventory for a rental property. Which is actually great; otherwise you would not even consider having house-sitters at your home, or looking after someone else’s, a concept that relies upon trust! But trust our experience, even though this ‘Home Inventory’ may seem basic, using procedures is the best way to avoid misunderstandings and protect the new friendly relationship you’ve just built. We have prepared this model here to help guide you, (you can download one here below).